In 2011, state policymakers transferred responsibility and funding for public safety and other services from the state to the counties. A major part of this “realignment” was that counties assumed responsibility for certain “low-level” offenders and parolees, all of whom previously would have served state prison sentences and been supervised by state parole agents upon release. While state corrections spending is below the pre-realignment level — with annual General Fund savings projected to be $1.3 billion in 2013-14 — these savings are largely offset by county corrections spending that is funded with dedicated special fund revenues provided through the state budget. Per capita costs for California’s prison and parole populations have continued to rise in recent years and are much higher than in the mid-1990s, even after adjusting for inflation. More than half (56.5 percent) of the state corrections budget goes toward prison security and operations, while nearly one-quarter (23.7 percent) of corrections dollars pay for adult inmate health care. A Mixed Picture also includes a status report on the federal court order to reduce California’s state prison population. A new CBP Budget Brief released today looks at Proposition 30, which was placed on the November 6 ballot by Governor Jerry Brown via the initiative process. Proposition 30 would increase personal income tax rates on very-high-income Californians for seven years and raise the state’s sales tax rate by one-quarter cent for four years. The CBP has endorsed this ballot measure. Proposition 30 would take an important step toward addressing California’s budget gap over the next few years. The measure would provide much-needed new revenues – an estimated $6 billion per year on average when fully implemented, according to the Legislative Analyst’s Office – and would help shield public priorities, such as education and safety-net supports for families hard-hit by the recession, from further budget cuts. 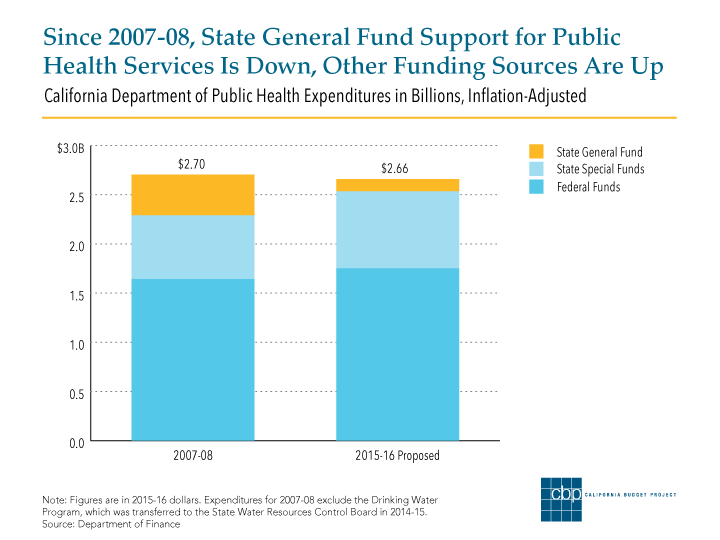 State General Fund revenues are lower today as a share of the economy than in all but two of the past 40 years. The state’s budget challenges are partly the result of a steep drop in revenues brought about by the Great Recession, but the shortfalls also reflect years of tax cuts, including large, permanent corporate tax breaks enacted during the depths of the downturn. Lacking sufficient revenues, lawmakers bridged recent years’ budget gaps through deep spending cuts to virtually all areas of the budget. To take one example, the state reduced Proposition 98 spending for K-12 education by $7.4 billion between 2007-08 and 2011-12 – a drop of $1,271 per student. Proposition 30 raises new revenues by asking those who have benefited most from the economic growth of recent decades to contribute the most to laying the groundwork for California’s future prosperity. As shown in our Budget Brief, the measure raises nearly 80 percent of its revenues from the wealthiest 1 percent of Californians, who have annual incomes over a half-million dollars and who experienced substantial income gains over the past two decades. The average inflation-adjusted income of the top 1 percent was 82.0 percent higher in 2010 than it was in 1987, while the average inflation-adjusted income for Californians in each of the bottom four fifths was substantially lower than in 1987. Low- and middle-income Californians – who bore the brunt of the Great Recession’s effects on the job market – would see very small tax increases under Proposition 30, on the order of $24 to $55 annually in sales and personal income tax increases combined. In contrast, those in the top 1 percent would pay an additional $21,883 in taxes on average. Proposition 30 presents voters with the opportunity to begin reversing a decade of disinvestment in California. The measure looks to the state’s wealthiest to provide the bulk of the revenues that would help stabilize the state budget and begin to restore funding for education and other critical public services, so that all Californians can share in the state’s future prosperity. Public opinion polling shows that Californians strongly support state spending for education and health and human services, but are less enthusiastic about spending on state prisons, also known as corrections. Solid majorities of the state’s residents, for example, say they are willing to pay higher taxes to support public schools, higher education, and health and human services in order to help close the budget gap, according to a survey conducted by the Public Policy Institute of California in May. In contrast, only about one out of six Californians (17 percent) said they would pay higher taxes to support prisons. The 2012-13 spending plan signed into law by Governor Brown last month reflects – for the most part – these priorities. More than 50 cents out of every General Fund dollar supports public schools, colleges, and universities, and nearly 30 cents out of every dollar goes to health and human services, including health care and cash assistance for low-income children and seniors. In other words, well over three-quarters of the state budget, roughly 81 cents out of every state dollar, goes to areas that Californians say are their top priorities. The share of state spending allocated to corrections – just under 10 cents out of every state dollar in 2012-13 – is down compared to 2010-11, but remains higher than many Californians might prefer. Prisons’ share of the state budget, however, is projected to drop further in the coming years, to less than 8 cents out of every state dollar. This decline is due to the recent transfer, or ”realignment,” of responsibility for low-level offenders from the state to the counties, which has begun to shrink the prison population and to move the state toward compliance with a US Supreme Court order to reduce prison overcrowding. While rarely addressed in public opinion surveys, the remainder of the budget – roughly 9 cents out of every state dollar in 2012-13 – supports veterans services, wildland fire control, environmental protection, and other key public services. This part of the budget also funds the institutions that comprise the state’s system of governance, such as the courts, the Department of Justice, and the Governor’s Office. Overall, state spending tracks closely with Californians’ priorities and supports the key public structures and services that are necessary for a strong economy and a high quality of life. Quick – what’s the biggest “piece” of California’s state budget pie? Nearly half (47 percent) of Californians think it’s prisons and corrections, according to a new Public Policy Institute of California survey. In fact, the largest share of California’s budget – 41 cents out of every state dollar – goes to public schools under the Governor’s Proposed 2012-13 Budget. In contrast, less than 10 cents out of every state dollar goes to prisons, and that share is likely to drop in coming years due to the recent “realignment” of public safety responsibilities from the state to the counties. These and other essential facts will be highlighted at the CBP’s upcoming briefing, “Measuring Up: The Social and Economic Context of the Governor’s Proposed 2012-13 Budget,” which will be held on Friday, February 3, from 10 a.m. to 11:30 a.m. To reserve your seat, click here. Hope to see you there.